Each year I look to the Annual International Resveratrol Conference for the latest reliable information on resveratrol. The second conference, Resveratrol12, was held last December 2012 and an updated set of recommendations were reported: www.resveratrol2012.eu. Resveratrol14 will be held in December 2014 in Hilo, Hawaii. A regional workshop was held in Tokyo, Japan, on October 2-3, 2013. The meeting brought together a wide array of leading international researchers to present and discuss the latest advances in resveratrol and derivatives on human health. As the Resveratrol Conference information stresses, the claims of the health-promoting effects of resveratrol are mostly based on animal and in vitro studies while human studies are lacking. Taking all the research to date into account, studies on the potential health and life-extending benefits of resveratrol are inconclusive. In spite of that, many public and scientific medias contain statements that resveratrol may prevent life-style diseases like cancer, cardiovascular disease, diabetes and Alzheimer’s disease as well as prolonging life. There are many resveratrol derivatives, but they have been much less researched. A high level of resveratrol derivatives have been found in Melinjo (Gnetum Gnemon) and other Gnetum species and the meeting in Tokyo directed special focus to resveratrol derivatives. Melinjo has been studied for more than ten years, mainly by Japanese scientists. Perhaps the biggest news in 2013 regarding resveratrol came from Sirtris co-founder and Harvard genetics professor David Sinclair who published new research in Science that showed how the red wine compound resveratrol and other compounds directly activate a sirtuin enzyme called SIRT1, an effect that has been disputed. Sinclair’s lab has linked SIRT1 activation to increased longevity and protecting organisms in vitro against diseases of aging. The most current research revealed the molecular mechanism for this interaction, and showed that a class of more potent drugs currently in clinical trials act in a similar fashion. Sinclair’s early resveratrol discoveries received sensational media coverage, but have been questioned by other studies that could not duplicate his findings. Pfizer claimed that resveratrol did not make active SIRT1. Sinclair’s latest article may have put to rest the controversy. As reported at www.fiercebiotech.com, Sinclair said, “I hope it restores confidence in the field and the ability to activate SIRT1 in drug development as a way to treat diseases of aging.” Glaxco bought Sirtris Pharmaceuticals in 2008, but so far only one drug, 2245840, a SIRT1 activator for psoriasis shows promise. Glaxco closed the Sirtris R&D facility in Massachusetts and consolidating the SIRT1 work into their lab near Philadelphia. It is estimated that it will be at least 10 to 15 years before the early Sirtris work comes to fruition as drugs that act like concentrated amounts of resveratrol. Associate Professor Cedric Saucier, who runs the enology lab at University of British Columbia’s Okanagan campus, discovered 23 new molecules related to resveratrol in extracts of Merlot, Pinot Noir and Cabernet Sauvignon. These new molecules, which still need to be analyzed and assessed, may contribute to the benefits of drinking red wine. A Danish study published in the Journal of Physiology was controversial in claiming that resveratrol found in red wine lessen the benefits of Crossfit exercise since resveratrol has been shown to mimic the effects of exercise training. The study of healthy men about 65 years old found that exercise improved their cardiovascular health but the effect was 50 percent less in the group receiving resveratrol compared to the group receiving a placebo. The reasons for this are unclear. The amount of resveratrol given to the subjects was about 100 times that found in one glass of Pinot Noir so athletes who drink wine should not be concerned that a glass or two of wine will negate all the effects of their exercise. Research published in the Journal Otolayrngology-Head and Neck Surgery found that giving rats reservatrol (Delta Labs Extra Strength Red Wine Extract) reduced the amount of hearing and cognitive decline due to noise-induced damage. Resveratrol significantly decreased levels of COX-2 which is increased by loud noise and linked to inflammation and hearing loss. Further studies are needed to see if the results can be duplicated in humans. A study published in the Journal of Nutritional Biochemistry found that grapes can improve the heart health of hypertensive rats with heart disease in as little as 18 weeks. In the rats who received a grape-enriched diet, the animals suffered a lower rate of heart failure and a lower levels of high blood pressure. It was postulated that grape polyphenols cause heart cells to produce glutathione, an important antioxidant in the heart. The study authors recommended eating whole grapes for the maximum health benefits. In the International Journal of Cancer, epidemiological researchers in Germany analyzed whether doses of resveratrol found in wine could negate the carcinogenic properties of alcohol. The results indicated that a person would need to drink 100 glasses of wine per day to reach effective dosages of resveratrol. The research team had previously published a study that linked alcohol consumption to cancer and this follow-up study found that the original study findings are not confounded by the possible anti-carcinogenic properties of resveratrol. A study published in Food and Chemical Toxicology found that de-alcoholized wine with a high concentration of the polyphenol, gallic acid, stopped aggressive bone cancer in the lab. A clinical trial showed that glucose metabolism is improved more by red wine than by gin. Published in Clinical Nutrition, this study of subjects at high risk of cardiovascular disease compared the effects of moderate consumption of red wine, dealcoholized red wine, and gin on glucose metabolism and the lipid profile. The results support a beneficial effect of the non-alcoholic fraction of red wine (mainly polyphenols) on insulin resistance, conferring greater protective effects on cardiovascular disease to red wine than other alcoholic beverages. There was some effect from alcohol, but polyphenols were even more important in improving glucose metabolism. Forum reviewer Dr. Arthur Klatsky said, “It joins the substantial number of reports presenting data suggesting that drinkers of red wine have more favorable levels of various markers of potential risk of atherothrombotic disease, compared with drinkers of other alcoholic beverages. However, without clinical endpoints, these reports indicate only hypothetical or potential benefit for disease. A study published in the Journal of Surgical Research found that resveratrol in red wine and grape skins inhibited the survival of melanoma cells undergoing radiation treatment. Simply treating cancer cells with resveratrol killed 44% of tumor cells. When resveratrol was combined with radiation treatment, 65% of tumor cells died. The researchers now plan to explore how to deliver resveratrol to tumor sites to treat cancers. The dose used in this study was extracted and far higher than levels naturally found in a glass of wine or grapes. Earlier work by the researchers found that resveratrol made prostate tumors more susceptible to radiation treatment. A study appearing in Nutrition and Cancer found that a procyanidin polyphenol (B2G2) isolated from grape skins and seeds and in a synthesized form inhibited cell growth and induced apoptosis (cell death) in human prostate cancer cells. The results confirmed previous studies in mice. A team of researchers in Korea published a study in Food and Chemical Toxicology that supports the cancer fighting power of resveratrol. This was the first study to look specifically at mesothelioma, a rare, aggressive cancer related to asbestos. Resveratrol in combination with clofarabine synergistically had a strong cytotoxic effect on mesothelioma cells. According to Wines & Vines (January 2014), University of British Columbia at Okanagan researchers have developed a new method for analyzing polyphenolic content in wine. Named “shotgun polyphenomics,” the test would give a unique “wine fingerprint” for each wine studied. Lynn Anderson, PhD, points out in an article titled, “Can an Apple a Day Really Keep Fatigue Away?”, at www.huffingtonpost.com, that resveratrol is not a bioavailable compound, meaning it is well absorbed by the gut, but its bioavailability is nearly zero. “It seems it is metabolized at such a fast rate that it does not make it into the blood stream.” She points out that resveratrol may need other compounds found in the natural state of foods for its bioavailability. Resveratrol and quercetin, two polyphenols extensively researched, may be most beneficial in their natural state in red wine and apples when they act synergistically in a diet filled with other fruits and vegetables. David Sinclair, however, feels that drinking a glass or two of wine won’t cure any major diseases because it is not potent enough. Research published in Neurology found that older adults who eat diets high in antioxidants may not have a lower risk of dementia or stroke. The Netherlands study of 5,395 people aged 55 years and older who ate or drank lots of coffee, tea, oranges, and red wine were just as likely to develop neurological problems over the 14 years of follow-up as those who skimped on antioxidant-rich foods. Since the study only looked at foods, it could not address whether antioxidant supplements have an impact on dementia or stroke risk. A study from Louisiana State University found that resveratrol can worsen multiple sclerosis symptoms in mice when taken as a supplement. The results were published in the American Journal of Pathology. The researchers were surprised as resveratrol has been associated with neuroprotective effects. The study authors discourage supplement use in patients with multiple sclerosis. One of the arguments against resveratrol supplements is that they do not contain alcohol and it is the combination of alcohol and multiple polyphenols such as resveratrol working synergistically in combination that appears to provide the health benefits of red wine. Also, resveratrol supplements contain a far lower dosage than research has shown to be of benefit and resveratrol is absorbed 250 times more effectively when consumed in wine as opposed to a supplement form. Although there is no scientific evidence that resveratrol supplements in humans have health benefits, the supplement business, which is not regulated by the FDA, is now a $30-million-a-year giant. Unfortunately, resveratrol supplements are probably a waste of money. Although there is no scientific evidence that wines with added polyphenol content are healthier for humans, there are producers touting these types of wines. Dr. Phillip Norrie, an Australian general practitioner and Pendarves Winery owner was an early advocate of polyphenol-enhanced wines (photo below). Kathleen Corsbie and Annie Winmill of Southern Wine New Zealand have introduced a range of wines named Balancing Act Wines that contain 40 times more resveratrol. The Balancing Act wines use the patented technology developed by Dr. Norrie that increases a wine’s resveratrol content without affecting color, aroma or taste. One glass of Balancing Act wine is equivalent to consuming the resveratrol contained in about 40 glasses of regular wine. The producers make no health claims. 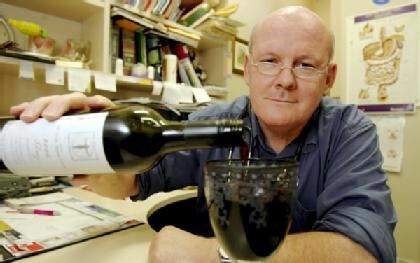 An Australian biochemist, Greg Jardine, has patented a group of compounds that are created during the winemaking process which have anti-inflammatory effects and may have benefit in treating arthritis and chronic fatigue. His process, called Modified Polyphenol Technology (patent pending), involves steps in winemaking that intensify certain processes and result in increased levels of fat-soluble tannins that are better absorbed than the common antioxidants in wine without making the wine less palatable. Preliminary study has shown that Jardine’s compounds improve the health of rats with arthritis. The wine is sold under the name, “Dr. Purple.” The dry style version of the wine is a combination of Shiraz and purple carrot. Visit www.drred.au.com. There is a trend that began last year of “healthy” alcoholic drinks that include wines infused with goji berries and ginseng, as well as lower calorie options according to the supporters of the Healthy Beverage Expo held in Las Vegas. Pinot Noir containing mulberry juice and omega-3s anyone?